Intel is getting ready to release "Ramsdale MLC", a new PCI Express solid state disk that will be marketed as the 910-series. The original Ramsdale was supposed to have SLC NAND flash memory, it was planned for Q4 2011 but for some reason it never got released. The new 910-series uses Intel High Endurance Technology (HET) MLC NAND flash memory made on a 25nm process, it promises to deliver write endurance close to that of 50nm SLC. The sequential read performance is rated at up to 1GB/s for the 400GB SKU and a massive 2GB/s for the 800GB SKU. The write performance is a fair bit slower, but hardly slow at up to 750MB/s for the 400GB SKU and 1GB/s for the 800GB SKU. As far as IOPS are concerned, we're looking at a read performance of up to 90,000 and 180,000 IOPS respectively for the 400GB and 800GB model and a write performance of up to 38,000 and 75,000 IOPS. 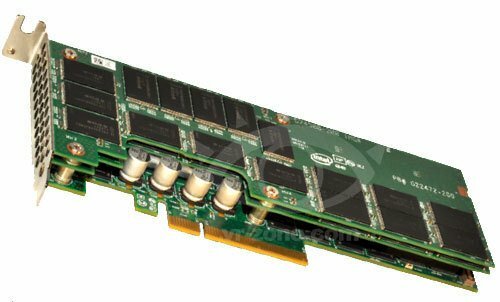 As for endurance, Intel is rating the two models at 7 and 14 Petabyte which should be compared to 1.5 Petabyte for the 710-series using overprovisioning, so in other words, these are work horse SSD's that can handle a lot of data. The card itself measures 69x168x19mm (HxWxD) which is a half-height PCI Express card and Intel has standardised on a PCI Express 2.0 x8 interface for both models. Intel is claiming a 25W typical active power draw, with idle power draw being 8 and 12W respectively for the 400GB and 800GB SKUs.